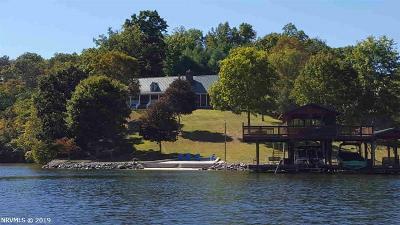 This is an amazing lake property with tremendous view of the lake and easy access to the water. This modular construction home has so much to offer. The home was completely taken down to the studs 2 years ago with all new plumbing, electric, drywall, and insulation at that time. A metal roof was added 6 years ago, and a MASSIVE wrap around front porch has lake view from every angle. The home is very modern and updated with a designer kitchen, stainless appliances, easy close drawers, dual sinks, and open concept. The masonary fireplace in the living room is incredible, and 4 large bedrooms and 4 baths await the new owners. There is a screened in concrete stamped patio just outside the kitchen, as well as a open air patio. The lake dock house is a HUGE 2 story, 2 boat lifts, 2 jet-ski lifts with private seats and upper level screened in area for entertaining. This may be the best lake home on the market this year, so make appointment to see. Directions: I-81 Exit 98. Go South On Rt. 100 To Left On Rt 644 (Hurston Road), Then Right On Hurston Road At Stop Sign. Follow To Near The End To Left On Skewes Lane. Once You Go Through The Gate, This Will Be The First Home On The Right. See Signs.